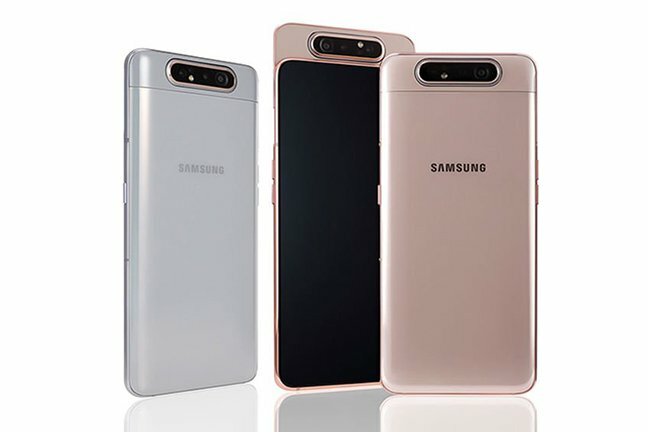 Analysis Samsung has shown a muscular response to the mortal threat of cheap Chinese rivals and long phone replacement cycles by packing its mid-tier phones with the exotic novelties of much pricier flagships. The seventh model of its range was unveiled yesterday, embodying the aggressive new move – and it's certainly the most eye-catching (click here for Sammy's slow-motion gif). The A80 is a slider phone: the slide reveals a rotating 180 degree camera, intended to function as both a main camera and selfie camera. Slider cameras were a familiar feature phone design that has rarely been brought to monoslab full-touch smartphones (Oppo is one of very few brands that perseveres with this approach). The inclusion of an on-screen fingerprint sensor and fast charging, a triple camera, and the 8GB/128GB specs make it a decent contemporary upgrade. It uses Qualcomm's Snapdragon 730 designed for "premium mid-range" phones. The A80 ditches both headphone jack and microSD expansion, however – a surprise given how pragmatic Samsung has been over these. It's priced at €649 (no official UK pricing has been disclosed yet) indicating it will be strong competition for Samsung's own Galaxy S10E (£669 SIM free). A companion, the A70, has already been announced. This marries a 6.7" Infinity-U (aka teardrop notch) display and hefty 4,200mAh battery to similar "flagship" features found in the A80: triple camera, in-display sensor. An even cheaper A50 also offers a triple camera, 4,000mAh battery, and in-display sensor without the mechanical slider priced at £310. Introduced in 2014, Samsung's A series is the mobe maker's mid-range. (The J series competes at below $250 in emerging markets). In recent years, Samsung simply chose a subset of features from the premium S range – not too many, lest it cannibalise sales of the pricier models. It's been a respectable but conservative strategy. Clearly that isn't enough. Samsung has now revised its A series with seven models at various price points, from the A10 to the A80 (an A60 is elusive). The gamble is that Samsung's brand and support infrastructure still counts for something, in a market where consumers hang on to their phone for longer. Some may be happy taking a gamble with a new name – only to get buyer's remorse when the phone isn't updated and support and repair issues arise. Both Xiaomi and Oppo have launched in the UK in the past months, with Oppo gaining a foothold on the high street via placement in Carphone Warehouse stores. Samsung also offers aggressive rebates and 0 per cent credit financing. However, the product itself actually matters, and with Honor/Huawei, Xiaomi and Oppo cramming flagship features into £500 phones, Samsung's range needed to stand for something other than "bits missing".